Light E+C is a series of preparations with very light textures. These products are especially suitable to skin types which cannot tolerate oily or greasy cosmetic preparations. The water based light preparations are readily absorbed by the skin leaving it moistened, radiant and fragrant with refreshing scent, without any greasy feel. The series fits the mature oily skin (35+) as well as normal or dry skin of women who prefer to use preparations with non oily light textures, especially during the warm seasons . It is a also a wonderful solution for the women who perspire abundantly on the face during the hot season. A light texture emulsion based of a combination of effective vitamins E and C. The serum contains a special active form of vitamin C, VC-IP, showing a better efficacy than the simple molecule of vitamin C (ascorbic acid). It is also much more stable and is not oxidized easily like ascorbic acid. This molecule penetrates the skin much better than the simple form of vitamin C. Many experiments and clinical studies demonstrated that VC-IP is a strong anti-oxidant effective in skin lightening and in the reduction of DNA damage following exposure to UV light. It was also demonstrated that VC-IP increases the synthesis of collagen in the skin and inhibits the MMP enzymes. These enzymes are major factor in the formation of wrinkles, in the degradation of collagen, elastin and other structural proteins in the dermis. Vitamin E has many beneficial effects on the skin: it increases the level of moisture in the horny layer of the epidermis, it has skin calming effect, it decreases the damage to the skin following exposure to UV irradiation. Vitamin E is a strong anti-oxidant protecting the skin cells from free radicals. A light texture moisturizing emulsion. It contains a special active form of vitamin C, and vitamin E, two powerfull anti-oxidants with many beneficial effects on the skin. The cream contains sunscreens. 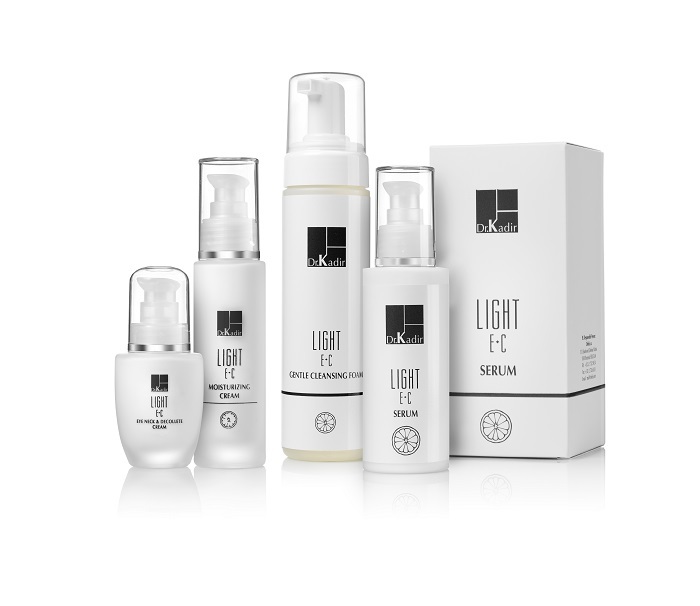 Light texture liquid emulsion containing vitamin E and vitamin C.The cream contains rutin, a natural bioflavonoid. Rutin is a constituent of the so-called vitamin P group. It has several beneficial activities when applied to the skin: regulation of capillary permeability, regulation of microcirculation, antioxidant and skin calming properties it is therefore a valuable ingredient for the eye zone for the relief of symptoms associated with impaired capillaries and microcirculation. Another valuable ingredient in this cream is Aqua Cacteen, obtained from the Opuntia Cactus which has been used in the Mexican traditional medicine for various purposes. Clinical and laboratory research demonstrated than Aqua Cacteen increases the moisture level of the skin, protects the skin from irritations and increases the skin's firmness. Light E+C Eye neck and décolleté cream further contains caffeine for its beneficial effect on puffiness and dark circles and soy isoflavones with collagen protecting properties. This foam cleanser is based on a special gentle mixture of foaming agents. It ontains vitamin E and panthenol, provitamin B5 with moisturizing and calming effects.